We offer Brass Labels & Name Plates such as Brass Labels required by any type of industry, Brass Stencils for paintings on Boxes, Brass Door Plates for companies & Individuals and Metal Tokens required by Banks. Clients can avail the offered products from us at the most reasonable price range. Pricing depends on Size and material Thickness. Size max 14" x 48"
Clients can avail from us superior quality Brass Door Plates that are known for their unmatched quality. In order to manufacture these plates, we use premium quality brass and cutting edge technology. In addition to this, these plates undergo various stringent tests to ensure their flawless performance. Due to its durable finish, longer service life, high tensile strength, lustrous shine, fine polish and low maintenance, the offered plate is highly acknowledged by the clients. We manufacture Brass Logos as per customer's requirement & artwork supplied by them in various types. 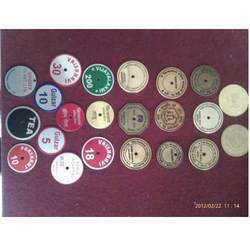 Backed by team of adroit professionals, we are involved in manufacturing, exporting and supplying a qualitative range of Brass Labels, Seals, etc. The offered labels can be bent, embossed, Nickel Plated & engraved. Offered labels are manufactured using the best grade raw material and sophisticated technology. Our professionals ensure that these products are delivered in perfect size and finish. These products are acknowledged among clients for their high quality standards, excellent polish and longer service life. 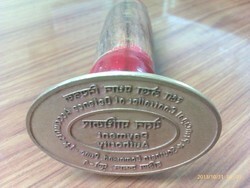 Banking on our enriched industry experience, we are able to supply Wax Seals. Clients can avail from us a wide range of Brass Stencils that is known for its unmatched quality and durability. Highly suitable to the contractors, the offered range is widely used as a base to create the artistic figures, numbers, alphabets or outlines. These stencils are fabricated using high grade raw material and latest technology. The offered range is well-known for their excellent finish and corrosion resistance. Apart from this, the can also be availed by clients from us in varied sizes and colors as per the various needs of clients. 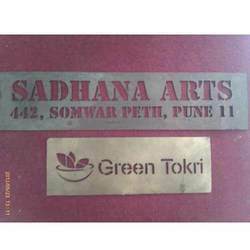 We manufacture Brass Name Plates, Labels, Scales as per customers requirement in a1 grade brass in reasonable prices. Accurate artworks are done by our well trained operators. also Labels & Monograms are done for vintage cars & bikes. 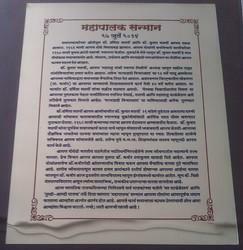 Brass Mementos (Maanpatra) required to be given to persons having social, Business recognition can be made in Brass 16 swg to 24 swg as per customer's requirement & can be given with or without photo frames. For the diverse requirements of our valued clients, we are involved in offering an exclusive array of Metal Tokens in Brass, Aluminum required by Banks, Hotels, Govt. Agencies, etc. ; Metal Key chains in St.Steel, Brass, Aluminum required by Hotels, Car & 2 Wheeler Dealers, Individuals, etc. These tokens & Key chains are developed by our experienced professionals at par with the set quality standards. Also, these are manufactured using the finest grade raw material and latest technology. Apart from this, these are widely acknowledged among clients for their optimum finish and longer service life. The offered products are rigorously tested on various parameters of quality in order to ensure their flawlessness. 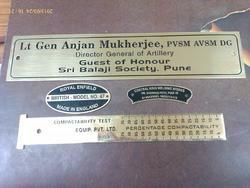 Brass Etched Name Plates on 16 swg for Display on Army Vehicles. We manufacture Pocket Plates in Brass for Schools, Hotels, Companies, Police, Security Personnel, etc. for identification of Their personnel.